Psychic Readings – dates and locations. Chicago Paranormal: Bielski and Shanahan reunite for special paranormal night 3/10/12. March 10th 2012, 7:30pm - 1:30am or later. A 44,000 sq ft; Haunted Historic Building that may be the largest for individuals to explore and experience in the Chicago land area. It is three levels of hallways and rooms that are like exploring in a huge maze, a maze with paranormal experiences. March 10th is special, not because we are reuniting for this huge haunted historic location, but because we are doing so as a fundraiser for the Valentine Boys and Girls Club in Chicago and is being held in their haunted historic building that we have an exclusive to provide a paranormal entertaining night there to explore and experience the location. It is located about one mile west of White Sox Park in a very good part of Chicago. You can reach it by Highway from 90/94 and I-55. Chicago Paranormal Nights - March 10th 2012. Oct. 2011 paranormal night comments. Ms. Ursula Bielski, Chicago's top paranormal author, paranormal researcher and guided paranormal tours and I reunite for what we were great at providing going all the way back to 2005 until 2010. Together it was Ursula assisting individuals with the Paranormal Investigation experiences throughout the night and I was providing the Spiritual / Medium experiences throughout the night with every paranormal night ending with my Circle of Energy Seance. We would hold paranormal nights at haunted locations for individuals to explore and experience. We were the first to provide a combination Paranormal Investigations and Spiritual Experiences in the Chicago land area until our individual schedules would not allow it any longer. This special paranormal night will also reunite the paranormal investigation team I used for years to assist me, along with Ursula and I and those participating on paranormal nights until again our schedules could not provide the time. They are: LAPS - Latin American Paranormal Society. A great team with great equipment who will also be assisting individuals on this night. Also assisting individuals will be Nichole Shanahan who is a very sensitive Spirit Feeler and my daughter, along with Michelle who assists Nichole. The Spirit Feelers Toni and Stacie (Mother and Daughter), will be assisting individuals, as well as new to joining in with me on this night, Sergio and Heidi are planned. Plus those who manage this huge location to assist you in finding your way around between the three floors to explore and experience. Some paranormal investigation tools will also be provided for individuals to use and it is always suggested to bring your own voice recorders, cameras and any other paranormal tools you may have. Not only will we be assisting you on this night, but will be doing Ghost Box sessions throughout the night in different locations of the building. Back in 2005 was my first experience and a successful one with a Ghost Box. It was one that was given to Ursula Bielski by a Ghost Box creator and we were using it at the Villisca Ax Murder House. Since then a Ghost Box, be it mine or others has become one of the things I work with at locations, as it is what I call an interesting tool. Also during the night others are able to work with it. Over the years I have refined how I use the Ghost Box that allows those present to be involved and interpret the results to the questions I ask. I am a firm believer in having others interpret what is coming across from the Ghost Box. I personally feel to keep it all on the up and up, it should not be the one asking the questions that interprets what comes across. When asking the questions I attempt to tap in to the Spirits present to attempt to know what questions to ask that could possibly present answers. It has become a regular thing to happen on paranormal nights, that when I leave a room and leave others work with the Ghost Box, my name is called out from the Ghost Box and Edward or Ed is not a common name today. Also during the night, you will be assisted with doing EVP sessions and EMFs usage, directed in the areas you should take photos etc..
As with all paranormal nights that I am involved with, this one will end with my Circle of Energy Seance. It is not me sitting at the table and saying this or that spirit is here, but attempting to have the Spirits interact with those present, so they become the Mediums and experience the Spirits in the location. This night is limited to the amount of individuals participating in the paranormal night to explore and experience the huge haunted historic 44,000 sq ft; location. 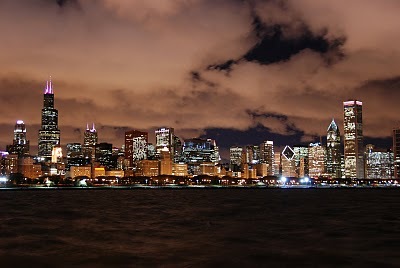 For more details about the location, the paranormal night and to reserve, go to: Chicago Paranormal Nights - March 10th 2012. Chicago Paranormal Nights - more paranormal dates and locations. Spiritual Observer - Psychic Reader - Paranormal Host. Edward Shanahan has been written about in four paranormal books. Providing Chicago Paranormal Nights to explore and experience the paranormal at haunted historic locations. Best Chicago Psychic Award – Edward Shanahan Edward Shanahan awarded Best Chicago Psychic. Private and House Parties. Chicago Paranormal Nights Public and Private Chicago Paranormal Nights to explore haunted locations with Edward Shanahan and each night ends with a seance. Edward Shanahan's Book – Taking The Paranormal and Spiritual World Seriously. Theories – Thoughts – Experiences Taking the Paranormal and Spiritual World Seriously. Is the way Edward believes it should be explored. In this book you will find his paranormal and spiritual experiences over the years.